America’s influence in the Middle East has fallen: Top 10 reasons. And the United States appears to be a blundering and dangerous giant. 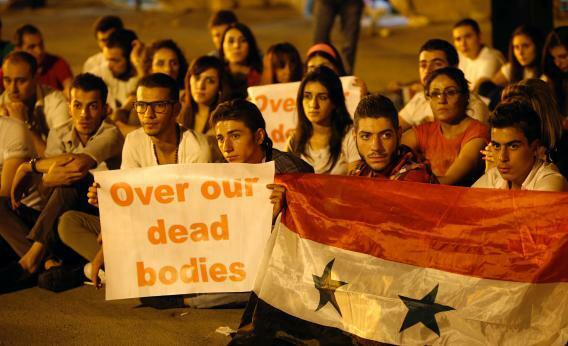 Syrians hold banners and flags during a sit-in protest against a military action on Syria on Sept. 13, 2013, in Damascus. By most assessments, U.S. influence in the Middle East has dramatically declined since the Arab uprisings began in January 2011. Critics have blamed this on inept diplomacy by the current administration, but this is only a partial explanation for America’s loss of authority in the region. Relations between Israel and the United States remain good, and Israel—under U.S. pressure—has agreed to renew talks with the Palestinians. Still, Israel continues to ignore U.S. concerns about the expansion of its settlements on the West Bank, which impedes resolution of the conflict. And Prime Minister Benjamin Netanyahu’s barely concealed contempt for the Obama administration during the 2012 U.S. presidential election nearly created a rupture in relations and alarmed many in America and Israel. The successful overthrow of Libya’s Muammar Qaddafi, in which the United States played a leading role, has left that country in chaos. The primary beneficiaries of Qaddafi’s ouster seem to be al-Qaida’s affiliates in North Africa and the Sahara. Egypt’s new leaders and those Egyptians who supported the overthrow of President Mohammed Morsi are angry at the United States for its condemnation of the army’s actions. Morsi’s supporters, meanwhile, remain convinced that the United States welcomes his removal and longs for a return to the reliable repression of the Mubarak era. Saudi Arabia, Kuwait, and the United Arab Emirates effectively reduced U.S. leverage by underwriting Egypt’s new regime with generous pledges of economic support that blunted any threatened cutoff of U.S. aid. Syria is at war with itself. The United States sought the removal of President Bashar al-Assad, yielded to domestic and international pressure and promised support to the rebels, then thought better of it as the more extremist, al-Qaida-aligned elements appeared to dominate the rebellion. That does not appear to bother the Gulf kingdoms that bankroll the rebels. Many critics in the region see the United Sates as an unreliable ally that cannot be counted on if a regime is threatened internally. Instead of supporting its longtime friends in the Middle East, the United States offers lectures on democracy and makes vacuous pronouncements about human rights. Worse, Washington draws red lines, then hesitates. When one can do very little, strategic silence might be a good idea, but in a fiercely partisan and media-drenched environment, leaders find silence untenable. Clearly the United States is at the margins of events in the Middle East, obliged to accept behavior and outcomes it does not like. The fault, however, lies not just in America’s decline as a world power or diplomatic incompetence. Here are 10 reasons why America’s influence over events in the Middle East seems to be in decline. Being expected to intervene diplomatically or militarily in too many situations at once inevitably risks failure. Diplomatic muscle, like law enforcement, depends largely on perceptions. If everyone decides to ignore the law at once, police will lose control. This is not to say that America should be the world’s policeman, although many expect it to act as though it were. People in the Middle East tend to exaggerate American influence over local events and remain convinced that the Americans must have a grand geo-strategic plan. The inevitable missteps are misinterpreted as part of some dark design, which is why America is blamed for the region’s problems, blamed when it tries to solve them, blamed when solutions fail, and blamed when solutions do not satisfy everyone. Regimes in the region are facing internal threats that are resistant to external pressure. These threats also may involve non-state actors that are even less influenced by diplomatic pressure. If people are determined to fight, the United States cannot stop them—at least not without military intervention, which does not end the shooting, but merely rearranges the targets. Fast-breaking developments are inherently hard to deal with, making it all the more difficult for the United State to influence events. No one knows what will happen next, not even the principals directly involved. Much is a matter of chance. Under the circumstances, intelligence forecasts require constant revision. Events have required the United States to transfer loyalties—always an awkward maneuver. At some point, Hosni Mubarak was doomed. After 33 years in power in Yemen, Gen. Ali Abdullah Saleh clearly was unable to rule the country and had to be eased from power. These were men the United States had done business with for decades. In Libya it was either countenance Qaddafi’s mass murder or intervene to speed his departure. The same principle would seem to apply to Syria, but Assad is a more formidable foe and his opponents offer no good alternative. Still, timing the transfer of loyalties is tricky—too soon and the United States stands accused of acting precipitously, too slow and it risks alienating the victorious opposition. Costly wars in Afghanistan and Iraq have eroded U.S. confidence and the political will to act. Americans are weary of war, and understandably skeptical about promises of easy military contests with positive outcomes. There is little domestic appetite for further engagements, especially becoming embroiled in another Middle East war—it doesn’t seem worth it. America’s opponents know that, further undercutting U.S. diplomatic muscle. It is difficult for the United States to exercise influence when there is little domestic consensus on what the country should do. Instead, U.S. policy navigates between the nation’s dedication to its democratic principles and the dictates of national security. Both views have powerful domestic constituencies. Often there are simply no good options for the United States. Syria is a good example. The United States is faced with a bloody civil war between a thuggish dictator on one side and quarreling rebels increasingly dominated by nasty jihadists on the other. The international situation is not favorable to action by America or anyone else right now. The United States has few reliable allies. Europe is divided on how to deal with events in the region. Russia and China are likely to block the United Nations’ endorsement of most actions, which does not prevent the United States from acting unilaterally, but makes it more difficult to muster broader international support. Almost any U.S. intervention would provoke anger on the Arab street. Some would point to America’s continuing dependence on Arab oil both as a vital national interest and as a constraint on U.S. policy. That dependence is declining, which means that the United States will be able to operate with a freer hand in the Middle East. It also means that there is less at stake for the United States, since national interest does not require intervention in the region’s seemingly endless crises. While the United States seems to be muddling through, other external and regional actors cannot claim to be to doing well either. The European Union has little influence and fears a return of those who went to Syria to fight. Turkey has slipped from resurgent regional power to having few friends. Russia’s only foothold in the region depends on the shaky future of Assad. The Iranians lost a partner in Egypt and may still lose a strategic ally in Syria. Still, the decline of American influence in the region has not made its policies total failures. Relations with Israel remain strong. U.S. assistance to Egypt has not been suspended, and relations there may be mended as the two countries focus on issues of mutual concern. Jordan looks to the United States for help. Iraq too seeks U.S. assistance in dealing with growing violence. Despite their independent actions in Egypt and Syria, which were never intended to be hostile to the United States, relations with Saudi Arabia and the other Gulf kingdoms remain good. The United States has brought about a new round of Middle East negotiations—clearly a diplomatic success, although the ultimate success of the talks themselves remains a long shot. Circumstances can change. A major U.S. action in Syria could suddenly reverse the perceptions of declining U.S. influence in the Middle East. But the opposite of being perceived as indecisive and feeble is not necessarily being perceived as skillful and powerful. Right now, the United States is probably seen as a blundering, but dangerous, giant.